^ Howley, Andrew (6 November 2013). "Rising Star Expedition: Prehistory in the Making". National Geographic Society. Archived from the original on 9 September 2015. Retrieved 8 September 2015. ^ Thackeray, J. Francis (2015). "Estimating the age and affinities of Homo naledi". South African Journal of Science. 111 (11/12). doi:10.17159/sajs.2015/a0124. Archived from the original on 8 December 2015. Retrieved 30 November 2015. ^ Thackeray, J. Francis; Institute, Evolutionary Studies; Witwatersrand, University of the; Johannesburg; Africa, South (11 October 2015). "English". South African Journal of Science. 111 (11/12). doi:10.17159/sajs.2015/a0124. ISSN 1996-7489. Archived from the original on 13 September 2016. Retrieved 6 July 2016. ^ Hawks, John (July – August 2016). 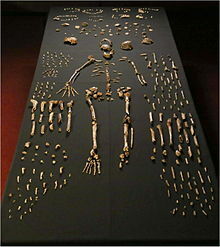 "The Latest on Homo naledi". American Scientist. 104 (4): 198. doi:10.1511/2016.121.198. Retrieved 17 May 2017.